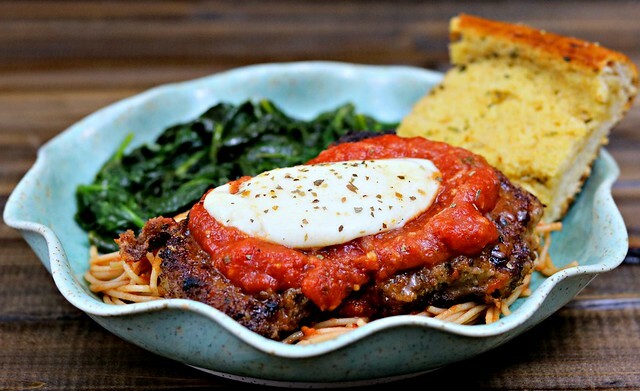 Crispy, pan-fried venison topped with marinara sauce and fresh mozzarella will become your new favorite way to prepare backstrap! J had great success this past hunting season and stocked our freezer with five deer. FIVE! And we love us some deer meat, but with that much, I definitely have to get creative sometimes so that I’m not making the same things over and over for 8 months, or however long it lasts us. I mean, don’t get me wrong, we definitely have our favorites that I make repeatedly, but…variety is good, y’all. And while helping me menu plan, and after I had just recently made these Chicken Parmesan Sandwiches, J saw a Parmesan Venison recipe and said it looked good. I opted not to use that recipe and instead prepare it the same way I had the chicken, and it was so good! And, I was able to use the rest of the fresh mozzarella slices I had, which is always a plus. It’s amazing how versatile venison really is. I mean, ground venison burger can be used just like any other ground meat is…burgers, meatloaf, meatballs, tacos, etc.! And now I realize that backstrap has more versatility than I realized, too! 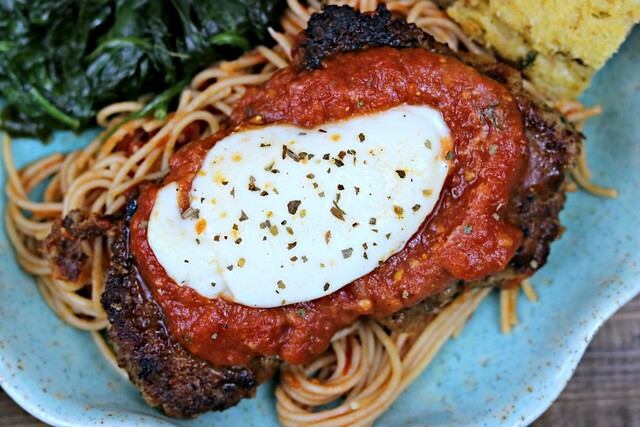 It’s very similar to Veal Parmesan in texture (chicken is general thicker, where veal and this backstrap are pounded more thinly), so if you have any non-venison lovers in your life, perhaps this could be the dish that changes their mind? I mean, who doesn’t love a crispy breaded piece of meat, smothered in marinara sauce and melty mozzarella?? And when you serve it over spaghetti with a big hunk of crusty garlic bread…well. Really, who could resist that? Use a meat mallet to pound the backstrap pieces to 1/4" thickness. Season each piece with salt and pepper and set aside. Place your flour, beaten egg, and breadcrumbs in three separate, shallow dishes in an assembly line fashion. Flour, then egg, then breadcrumbs. Dredge each of the venison pieces in the flour, shaking off any excess, then in the egg, and finally in the breadcrumbs, making sure to coat each side well. Place carefully into the pan and cook for 2-3 minutes, until nicely browned, then flip and cook another 2-3 minutes, or until cooked through. You don't want to overcook and dry them out, so keep a close eye on them. When the venison is mostly cooked through, top with a few spoonfuls of marinara sauce and a slice (or two) of mozzarella. At this point you can either place a lid on your skillet to help the mozzarella melt, or pop it in your broiler for a minute or so. 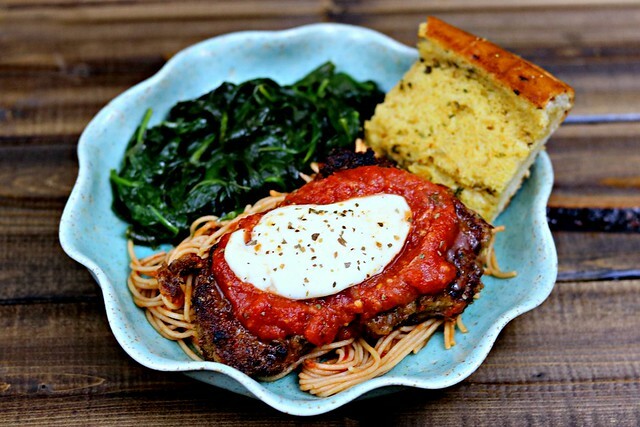 Top with basil, if you like and serve over spaghetti with your favorite veggie and some good, crusty bread!